For many women and couples around the world, conceiving a child seems impossible. There can be fertility problems with either the male or female, and in some cases, both. Where this issue arises, there are alternative options to aid in conception. 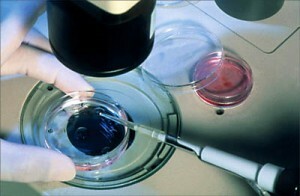 A process called assisted reproduction may be available to some couples. A process of determining eligibility must occur along with general health testing and a psychological exam. It must be decided that the couple is healthy, both physically and mentally, for this procedure to occur. Speaking generally, ART is any process of doctor assisted conception or fertilization to promote the birth of a child. There is not a clear definition as to which procedures fall into this category. Couples are both tested for fertility. When it is determined which half of the couple is the culprit of infertility, a discussion regarding treatment options can occur. Based upon the results of general physical tests and the results of fertility testing, a physician may order some lifestyle changes to occur first. This leads to another fertility test down the road. Getting both bodies in good physical condition is the first option to try. Following this initial testing process, stress tests are often administered. Stress can play a big role in infertility. The results of all of the above testing open up treatment options for the physicians to offer to couples. Selecting the right procedure to try first is often the most simple. When the female is the cause of the conception problems, hormone treatments are usually the first option. This includes an oral medication like Clomid. Physicians tend to start with the least evasive procedure first. In many cases, simple oral medication and hormone boosting drugs are all that a couple needs to conceive. More evasive procedures, such as those mentioned above are reserved for those that are unsuccessful with medication treatments. 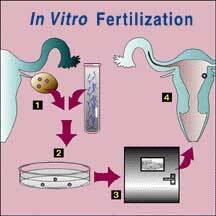 In Vitro fertilization is often used as the last resort, other than oocyte donation processes. With this process, the female is given hormone treatments to promote multiple egg development. A short maturation period is used before the harvesting of eggs occurs. Once the eggs and sperm are collected from the couple, the process of fertilizing the eggs outside of the bodies takes place. The fertilized eggs must be implanted into the female’s body within 72 hours. This is not a guarantee but it does carry a 50-percent or greater success rate in women under the age of 30. As with any medical procedure, there are risks. In women, it is depression, unstable hormone levels and over stimulation of the ovaries and follicles. Unbalanced hormones can cause periods of mania and rage in some patients. It is important to discuss the available options with the treating physician. Joining a support group for stress reduction during this process is also a good idea. Couples that struggle with conception have options. It is important that they not give up on the possibility of conceiving. Technology has advanced greatly to make this a possibility for many couples. When undergoing treatment, both members of the couple must follow doctor’s orders. A misstep can lead to unsuccessful conception attempts. Using assisted reproduction measures, hundreds of couples are able to live out their dreams of having a child each and every year.